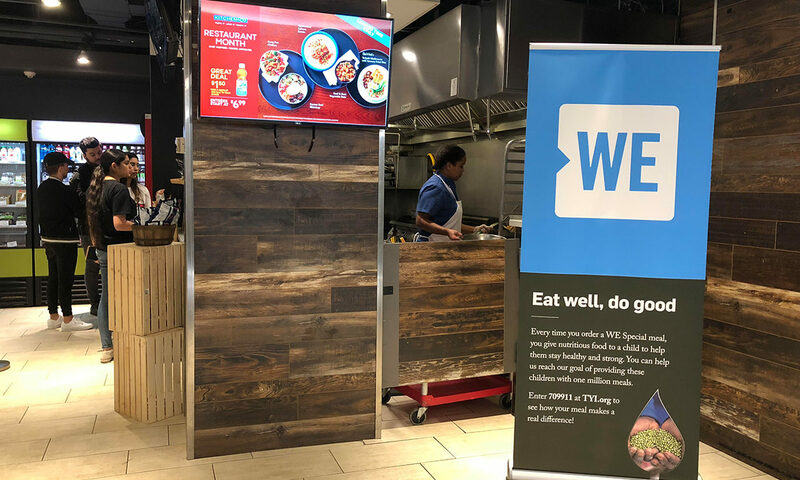 Ryerson students can help feed a child in need, locally and globally, when they buy a meal from the new WE Special — a recently launched menu at the Hub Cafe in Jorgenson Hall. Chartwells Canada, the organization that manages Ryerson’s food services, recently established a partnership with WE, a charitable organization that provides financial support for youth-serving programs around the world. Chartwells president Ashton Sequeira said this partnership aims to provide communities with the skills and resources needed to ensure everyone has access to sustainable and healthy food. Chartwells donates 25 cents to WE for every meal purchased from the Special menu, which launched on Sept. 18. In the first week alone, 521 meals from the menu were sold, totalling about 74 meals per day, said Voula Cocolakis, the executive director of Ryerson’s business services. Cocolakis added that once a student or staff member purchases from the WE Special menu, they are given a code to track their impact. The code can be entered on WE’s website and it allows the individual to see where in the world a child will receive a meal from their contribution. According to Sequeira, the WE Special was created to deliver cost effective meals to consumers that are priced similarly to other foods found in and around Ryerson. He said the basis of Chartwells’ partnership with WE is centred on “empowering students across Canada with the ability to make a difference through their everyday food choices.” Sequeira added that it gives people the chance to help change the world. Abbey Humphreys-Morris, an anthropology student at Ryerson, said she is more likely to purchase food from the WE Special than a menu that has no similar impact. “If I have enough money to buy food from somewhere, I should help out others by buying from a service like this, where I’m not the only one who gains from my purchases,” said Humphreys-Morris. Ana Creighton, a Ryerson graduate and master’s student agreed with Humphreys-Morris. She said WE is a great opportunity to give back and said she will be visiting the Hub Café more often now. Every day, different foods are offered on the WE Special. For more information about which foods are available, visit the Chef’s Table located inside the Hub Café.